Martingale / Greyhound collars wide dog collars are designed for large dogs and dogs with long necks such as the Greyhounds, Whippets and Salukis since their necks are larger than their heads and they can easily slip out of collars. A very pretty green and gold martingale collar in sizes to fit medium to very large dogs. A "hot" martingale dog collar perfect for medium to large dogs. A "sweet" cotton martingale dog collar perfect for medium to large dogs. A cotton martingale dog collar in teal, turquoise blue and gold butterfly wing print. For medium to large dogs. A colorful martingale dog collar featuring whimsical clouds and stars. A pretty martingale dog collar with turquoise butterflies and orange flower blossoms. A hauntingly beautiful martingale dog collar with skull print. Fire red dragonflies and butterflies decorate this batik martingale dog collar. These collars are known as Martingale collars, Greyhound, Whippet, Sighthound and humane choke collars. Choose from Swarovski Crystal bling, bold and beautiful leather, silk or nylon in a variety of colors and styles. 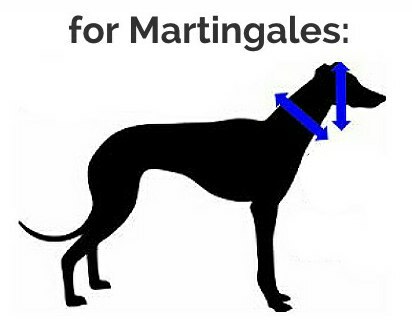 A martingale, or greyhound collar is made with two loops. The larger loop is slipped onto the dogs neck and a leash is then clipped to the smaller loop. When the dog tries to pull, the tension on the leash pulls the small loop taut, which makes the large loop smaller and tighter on the neck, thus preventing escape. Properly fitted, the collar will be comfortably loose when not in use. These collars have gained popularity among other breed owners in the recent past with many trainers now recommending them instead of choke chains or buckle collars. You can always find a vast array of designer Martingale collars for your dog at Snooty Pooch Boutique. Sighthounds: Afghan Hound, Azawakh, Borzoi, Chippiparai, Combai, Galgo Español, Greyhound, Hortaya borzaya, Irish Wolfhound, Italian Greyhound, Kanni, Longdog, Lurcher, Magyar agár, Mudhol Hound, Polish Greyhound, Rajapalayam, Rampur Greyhound, Saluki, Scottish Deerhound, Sloughi, Taigan, Whippet.